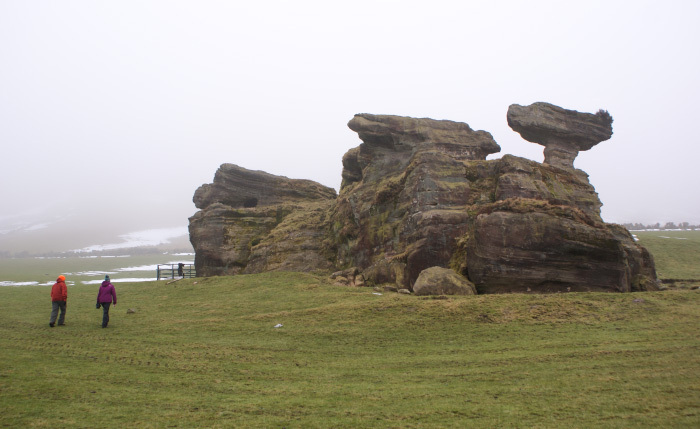 A gentle walk along field edges to visit one of the weirdest rock formations in all of Scotland - the Bunnet Stane. Path info: Grassy field edges. Sheep likely to be grazing. 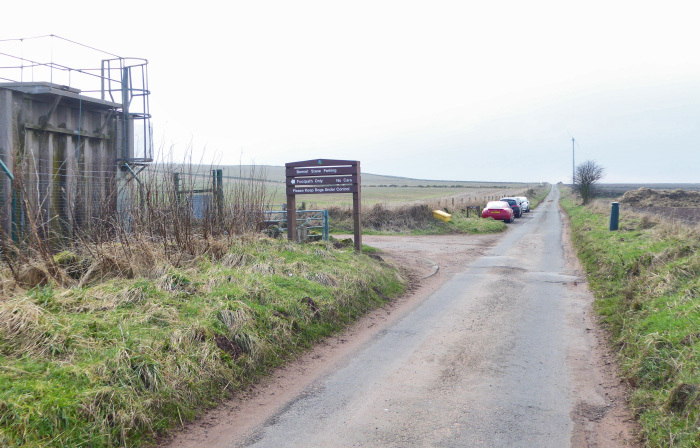 Start & finish: The layby next to the Scottish Water building on the minor road between Strathmiglo and Wester Balgedie, within sight of the wind turbine. Go through the pedestrian gate next to the Scottish Water building and head towards the hill, following the clear path that runs alongside the stone wall. Always keep to the edge of the field. After about half a kilometre the path bends right and then left, before reaching a wooden stile and gate. Cross over the stile into the next field and continue towards the hill, still following the line of the stone wall on your left. Sheep graze these open fields so keep your dogs on short leads or under close control at all times, and pick up your dog poo. After passing some gorse bushes the path goes through a gap in a stone wall where a gate used to be, into the next field. If you look up ahead you can now see your destination, the strange mallet-shaped bonnet. Follow the path along the field edge until you pass through another gap in the wall where a gate used to be. The Bunnet Stane is now right in front of you, and you’re free to walk up and around it at your leisure. 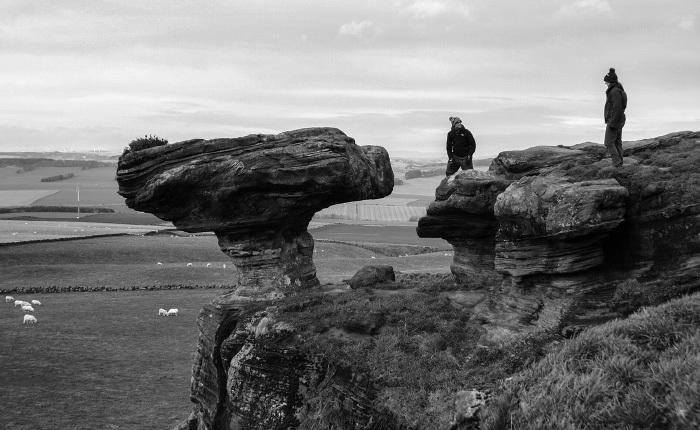 The improbable mushroom-shaped sandstone bunnet (or bonnet) is a product of relentless weathering by wind, water and ice over thousands of years. Hollowed out of the sandstone below the bunnet is a man-made cave, known as the Maiden’s Bower, and an information panel at its entrance tells you more about this peculiar place. Rearing up above the Bunnet Stane is the steep escarpment of West Lomond, the highest point in Fife, which can be attained via the very steep path that can be seen climbing up and away to the left. That’s a serious undertaking for fit and properly-equipped hillwalkers though, so just head back the way you came.